In one of my first posts, I talked about various harness-and-strap options for keeping your dog safe in your car. The solution that I came up with was a combination of the strap from a PetBuckle seat belt harness kit and the CanineFriendly 3-in-1 vest. That combination still works for Chloe, but I’m always on the lookout for alternatives to tell you about. 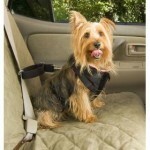 When I saw the Solvit Pet Vehicle Safety Harness on Amazon, I decided to check it out. Here’s what I like about it. The portion of the vest that covers your dog’s chest is very well padded with faux sheepskin. In an accident, that padding would be a big help. The opening for the head is wider than Chloe’s CanineFriendly vest, so it’s easier to get your dog’s head into it. Like the CanineFriendly vest, the Solvit vest clips closed by way of two big, easy-to-handle clips at the ends of straps reaching up from under your dog’s chest. The D-ring to which the restraining strap is attached is located halfway down your dog’s back, not behind her neck, giving your dog the scope to lie down while traveling. The restraining strap is long enough to allow your dog some freedom of motion, and the end of it attaches either to the lap portion of a backseat safety belt (keeping your dog closer to the seat) or to the diagonal portion (allowing your dog to put her paws up on the windowsill). And the product is built like a brick chicken coop, with heavy steel D-rings, O-rings, clips and buckles. That, however, turns out to be why I’m sending it back. Usually, for me, sturdier is better, and if I had a bigger dog I’d be tossing bouquets around. This product, though, is just too darned heavy for a small dog. The package says that it will fit dogs weighing 6 to 25 lbs. I’m here to tell you, though, that it’s too heavy for 13 lb. Chloe. If your dog is, say, over 20 lbs., check this harness out. Otherwise, I suggest sticking with the CanineFriendly vest.